ClearView 9.0 is the latest software release for the ClearView line of video quality analyzers. Video Clarity will showcase the new RTM Manager, now with automated QoE. The monitor is perfect for OTT or VOD applications. Video Clarity will launch the new RTM Manager with automated file QoE, a new configuration of its RTM real-time audio and video monitoring solution. RTM Manager with file QoE applies an easy-to-use, automated file-testing routine for VOD or OTT file-encoding workflows for users that need an added layer of video and audio quality measurement, with a threshold for recording low-quality events in the baseband domain. 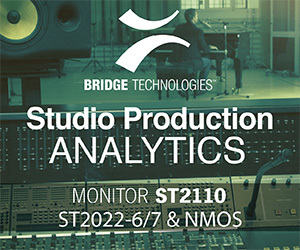 Built for postproduction and file delivery centers that handle all kinds of content, this new RTM solution's automated measurement process tests HD and SD video faster than real time to accelerate the test time per file of both long- and short-form programming, then presents results and errors for review. The RTM Manager browser interface gives users easy access for setup and testing feedback, while the ability to automatically test multiple files in a series limits the amount of necessary human intervention. Also on display will be Video Clarity's Venue Player IP, a new version of the company's video server that automatically plays multiple uncompressed segments of content to multiple screens in precise timing and sequence. The new version applies recently developed and standardized media flows for playing video and audio according to SMPTE ST 2110. Video Clarity booth visitors will be the first to see RTM IP, a new model in the line of RTM real-time audio and video monitoring solutions and the most accurate real-time audio and video quality measurement device available. For the first time, users can apply perceptual video quality tests to encode processing in an ST 2110 network environment simultaneously with audio quality, lip sync, and full program loudness up to 16 channels. The company will also introduce ClearView 9.0, the latest software release for its ClearView line of video quality analyzers. Driven by customer input, version 9.0 boasts several new features that help day-to-day users save time and get more utility from their existing ClearView systems. One major update is NIQE, a new high-performance, no-reference metric that provides accurate quality measurement when a source reference is not available. Rwo more new features in ClearView 9.0 are 12-bit video image support and HDR signaling for HDMI on ClearView outputs. Support for 12-bit video is important for users who simply want to record, play, and review higher-bit-depth native content that is upstream of delivery methods — an option that was not available in ClearView until now. Similarly, integrated HDR signaling means program originators and service providers no longer need to use an external converter on HDR videos being played from ClearView systems for all HD and the lower 4K frame rate ranges provided by the ClearView native HDMI output. Thanks to improved streaming technology, a lot more fans are going to be watching the Super Bowl on mobile screens. Today’s broadcast engineers face a unique challenge, one that is likely unfamiliar to these professionals. The challenge is to design, build and operate IP-centric solutions for video and audio content.